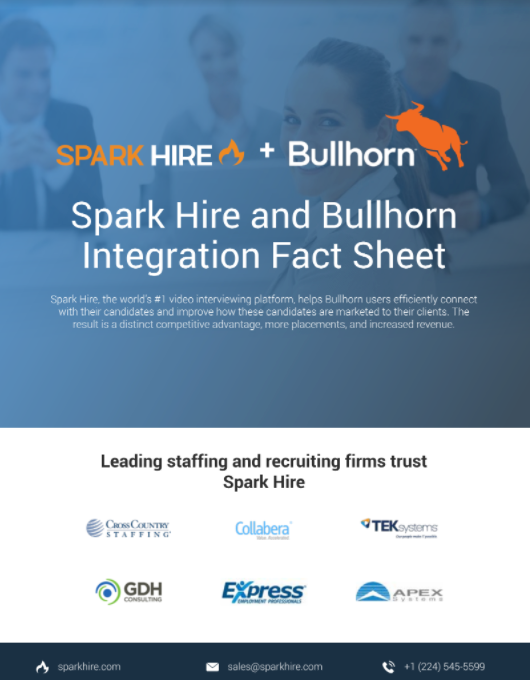 Spark Hire, the #1 video interviewing platform with more than 3,000 customers, helps Bullhorn users efficiently connect with their candidates and improve how these candidates are marketed to their clients. The result is a distinct competitive advantage, more placements, and increased revenue. Schedule one-way and live video interviews directly from a custom tab on a Job or Candidate page in Bullhorn. When one-way and live video interviews are completed, the recordings are available for review on the Candidate page in Bullhorn. After determining that a candidate is a potential fit for one of your clients, share a link with your client to direct them to a branded landing page containing the candidate’s completed interview. Improve how you market candidates to clients with video interviews. Coach candidates to record high-quality video interviews, send a shortlist of your top candidates’ video interviews to clients, and empower your clients to make faster decisions about which candidates they’d like to pursue. Staffing and recruiting firms using Spark Hire see significant improvements in key metrics such as submit-to-hire ratios, placement speed, and revenue growth. For example, Agility HR Group improved its submit-to-hire ratio from 3:1 to 2:1 and increased revenue by 300%. In addition, Hunter Ambrose Executive Search Firm increased its placement speed by 50%. The bottom line is that video interviews help you get candidates in front of clients quicker and makes them more tangible so faster placements can be made. Thanks to the Spark Hire and Bullhorn integration, you’re able to watch and share video interviews directly from your Bullhorn account. 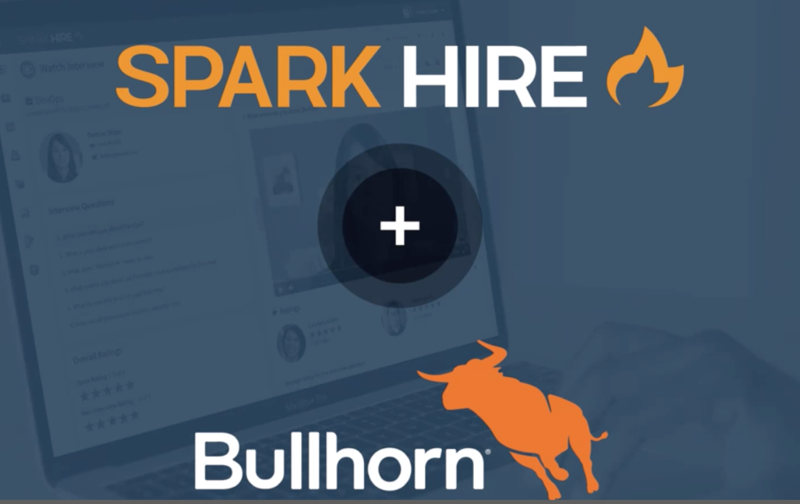 The video interviews that candidates submit are viewable from the Spark Hire tab on the Candidate page in Bullhorn, which makes it easy for you to review them before sharing. Leverage the integration to add video interviews as part of your workflow within Bullhorn. Improve how you market candidates to clients with video interviews. Coach candidates up to record high-quality video interviews, send a shortlist of your top candidates' video interviews to clients, and empower your clients to make faster decisions about which candidates they'd like to pursue. Staffing and recruiting firms using Spark Hire see significant improvements in key metrics such as submit-to-hire ratios, placement speed, and revenue growth. For example, Agility HR Group improved their submit-to-hire ratio from 3:1 to 2:1 and increased revenue by 300%. In addition, Hunter Ambrose Executive Search Firm increased their placement speed by 50%. The bottom line is that video interviews help you get candidates in front of clients quicker and makes them more tangible so faster placements can be made. Thanks to the Spark Hire and Bullhorn integration, you're able to watch and share video interviews directly from your Bullhorn account. The video interviews that candidates submit are viewable from the Spark Hire tab on the Candidate page in Bullhorn which makes it easy for you to review them before sharing. Leverage the integration to add video interviews as part of your workflow within Bullhorn.